Cookies for Breakfast? 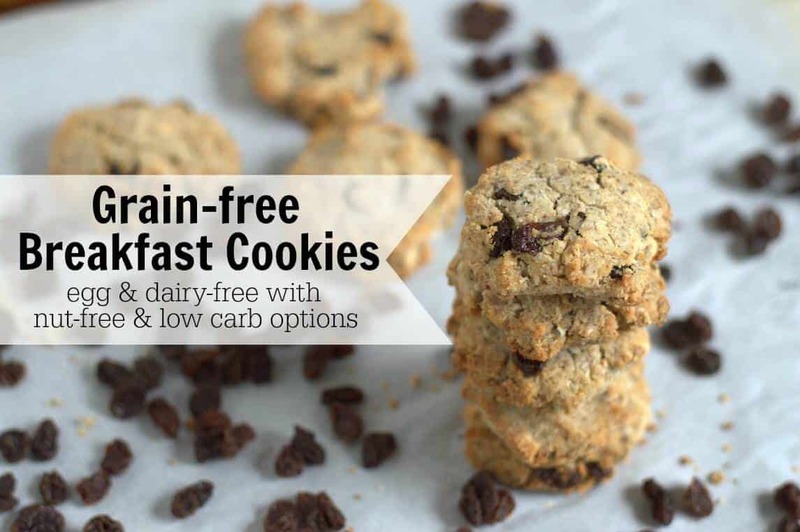 Yes you can when it's these healthy Paleo Breakfast Cookies. For awhile now, my family has been eating fewer grains, in an attempt to work on our gut health. Meals are fairly easy, but having healthy snacks that we can take on the go is a little rough. We typically lean on these No-Bake Coconut Delights, Crispy Green Bean Chips, Homemade Protein Bars, and Homemade Gummies, but my boys have been craving cookies lately. 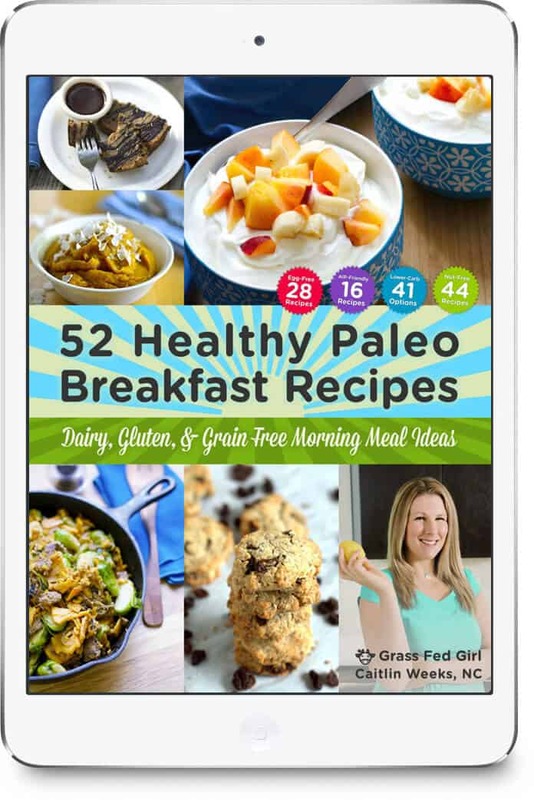 So I'm especially pleased to have found this fabulous new recipe for Grain-free Paleo Breakfast Cookies in a fabulous Healthy Breakfast book. 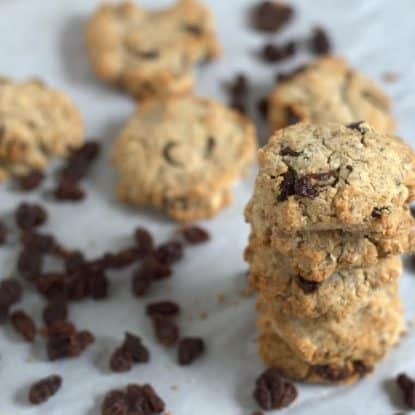 The thing that is extra special about this recipe is that while it's a recipe for paleo cookies, it's adaptable for the Autoimmune Paleo Diet, something that I hope to write more about soon. 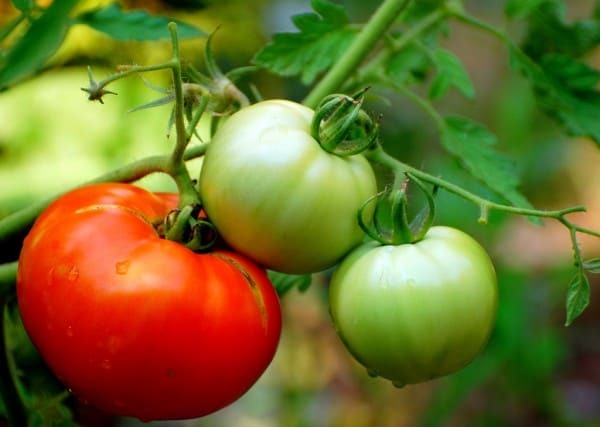 It's a diet that has helped so many people with autoimmune diseases feel so much better. These paleo breakfast cookies are sweet, but not too sweet, and they're super filling, which is so nice — they really satisfy your hunger and keep you full so you're not so tempted to overeat. I tend to make these grain-free breakfast cookies small so that they stay together better (see my Gluten-Free Baking Tips for more tips that will help you in the kitchen.) The recipe yielded about 18 cookies that way. 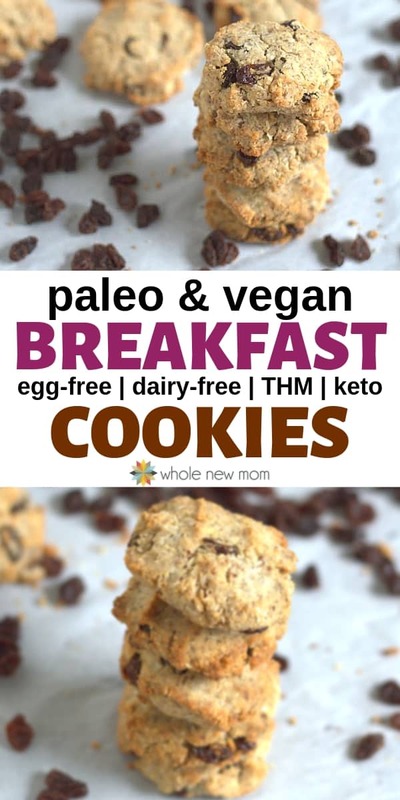 These paleo breakfast cookies are certainly healthy enough to have on a daily basis, and even are healthy enough for breakfast. Which makes me feel really good. Getting all of that healthy coconut into my kids makes this mom happy. For a lower-carb version: Either omit raisins or substitute either Homemade Chocolate Chips or chopped walnuts. For AIP version: Use gelatin instead of the flax so that you are essentially making a gelatin egg instead of a flax egg. Also use organic coconut butter instead of almond butter. This also gives you a nut-free option. For homemade versions of either option, see Homemade Coconut Butter and Homemade Almond Butter. You can use 1-2 scoops stevia extract powder. See How to Use Stevia. 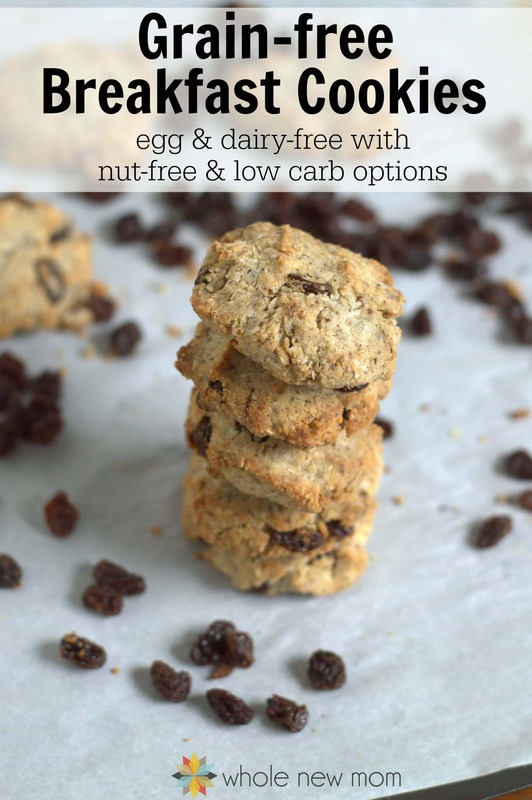 These Paleo Breakfast Cookies are super healthy and easy to make -- Breakfast Cookies that are grain, egg, and dairy-free w/ low carb and nut free options. In a small bowl, mix the flax seeds, water, lemon juice and vanilla and let it sit for about 10 minutes, until it forms a gel. In another bowl, whisk the coconut flour with the baking soda, salt, and cinnamon. Add the shredded coconut and raisins and mix until well combined. Melt the almond butter and sweetener in a saucepan over medium heat. Add the almond butter mixture to the dry ingredients and stir well. Add the flax gel to the dough and mix until a thick, sticky dough forms. Scoop the cookie dough into 2-inch mounds and place on the prepared baking sheet about 2 inches apart. Repeat until all the dough is used. Bake for 15 to 18 minutes, until golden brown. Let the cookies cool on a wire rack. 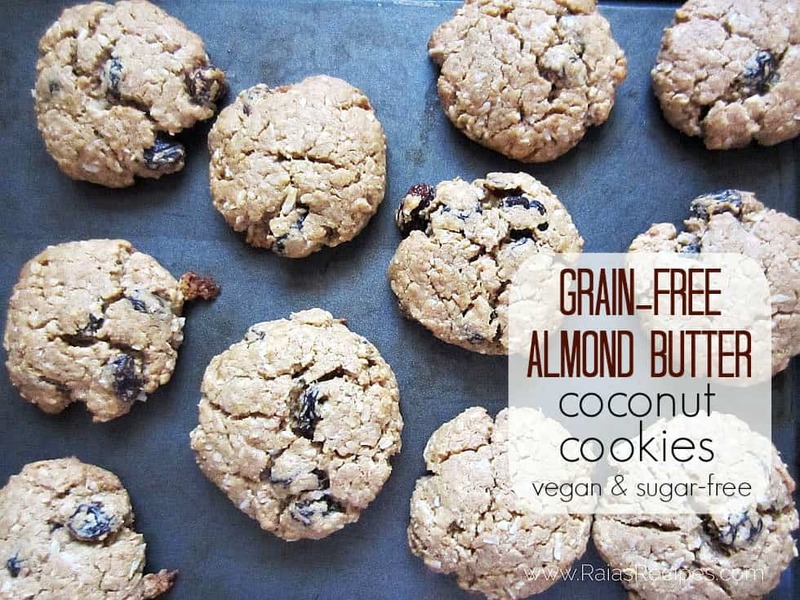 If you like this recipe for grain-free breakfast cookies, you should look at Caitlin Weeks' of Grass-Fed Girl‘s fabulous book of all grain-free breakfast recipes. 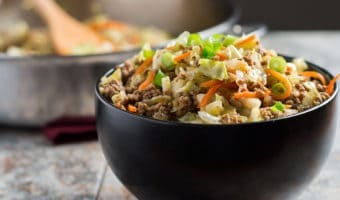 I've had a few of these recipes and they are great — and I'm sincerely looking forward to trying all of them. My oldest is deathly allergic to eggs, so I'll be a little limited, but the egg free recipes are just perfect. Hope this recipe helps you have healthy snacks available for you and yours. What's your favorite Healthy Breakfast? Sorry for the delay–finally got around to this and the notes are there. Thanks for reading and hope you like them! Kids and I loved these!! Thank you! Was coconut butter called for? It’s in the directions but not ingredients. I just assumed it was mistaken for almond butter. I am so glad you enjoyed these! Yes, the coconut butter was mistaken for the almond butter. Sorry about that. Coconut butter is the AIP substitute for almond butter, so we put that option in the instructions accidentally. One more question. We ate all but 4 last night and I put the rest in a zip lock bag. This morning when going to eat the rest, every single one had a dark green center. What in the world!? We chose to throw them sadly. But, any idea?? Hi there – did you use sunflower in the recipe? Yes we didn’t have enough almond butter so used a little sunflower seed butter. That’s it! The chlorogenic acid (which is chlorophyll) in sunflower seeds reacts with the baking soda or powder when baked and causes a harmless green color. Sometimes using a little lemon juice or other acid will counteract that but not definitely. I am about to bake up a batch, so an update is to come. I will say, however, that these are not for those who are strictly paleo. 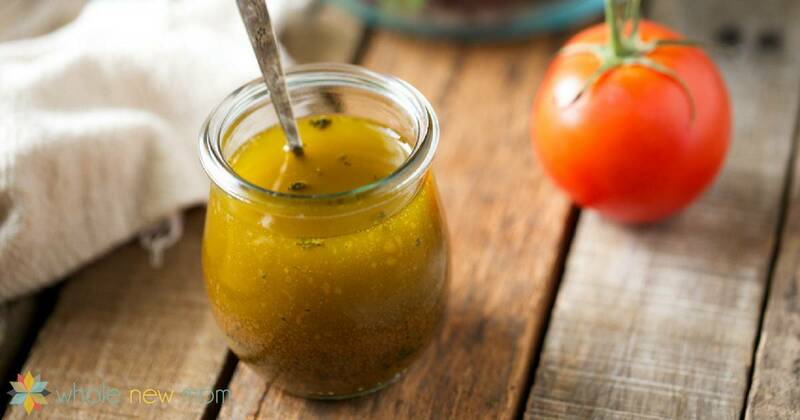 I began paleo with my husband, but have some ingredients I would feel wrong throwing out. So, I will rid the rest of my honey and bake some of these! Stevia is also not paleo approved, as is it refined. Do these freeze well? Can I substitute peanut butter for the coconut butter? I also need to use through my jar. I have not heard about stevia not being paleo but folks often don’t use it on the AIP diet. They should freeze well but I haven’t tried. You can sub in the peanut butter for coconut butter. :). Sorry? Are you saying you ended up w/ soupy cookies? Or you want soupy cookies :)? Would a chia egg work just as well as a flax egg? I think I’ll try it. Thanks for your blog! You’ve helped me so many times and we have so many things in common.